We are always looking for some healthy, easy and quick evening snack for our kids and family members. Here’s one such delightful, healthy and tempting evening snack I would like to share with you all. It is none other than Red Aval Kara Kozhukattai. This kozhukattai is totally an irresistible and healthy recipe which you should never miss to try. Before going into the recipe, let me share a few things about Poha/Aval. Poha/Aval is flattened/beaten rice. Rice is first parboiled, then flattened by pounding to remove the husk and dried. The drying process takes about 2 days. During this process partial fermentation takes place thereby bringing forth probiotic bacteria [which help in absorbing nutrients in the gut] and all the B-Vitamins. Parboiled, flattened dried Red Rice is red poha/red aval. Red Rice is a concentrated source of nutrients such as vitamin E, folic acid, thiamine magnesium and zinc. They are also rich in fibre and manganese and aids in easy digestion. Red Aval has all the nutrients present in the red rice and also is packed with iron which is essential for growing children, pregnant and lactating women. It is very low in gluten content. Using red poha/aval is beneficial in diabetics due to the slower release of carbohydrates due to all the nutrients present in it. Ok friends, having shared a few things poha/aval [info:google,Wikipedia and other sources] I would like to move on to the recipe. 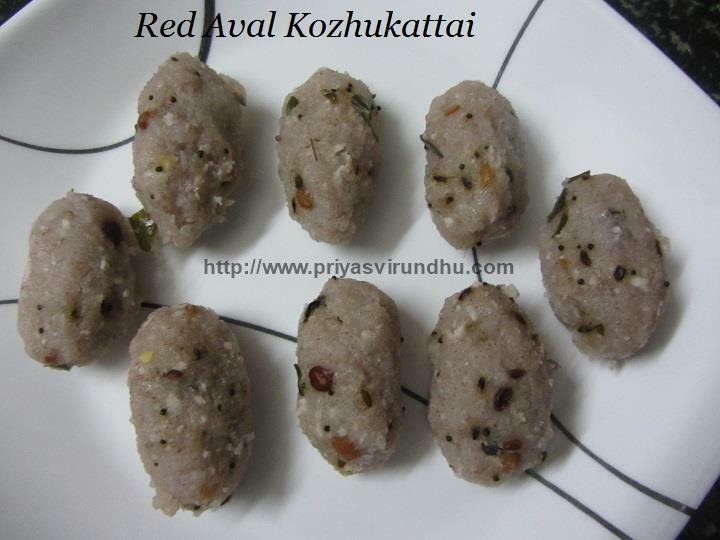 Do try out this wonderful Red Aval Kara Kozhukattai which can be served as lovely evening snacks or as healthy breakfast and post your comments here. Meanwhile do check out other interesting Aval Recipes and Kozhukattai Varieties here. Advance Vinayagar Chaturthi wishes to all of you. 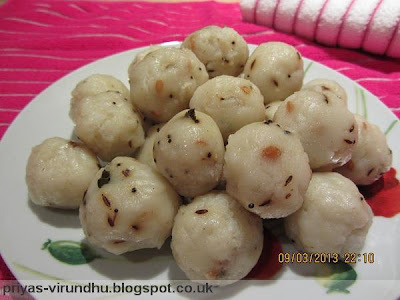 For this Ganesha Chaturthi I am posting a very special Kadalai Paruppu Kozhukattai, I have already posted modagam with coconut and jaggery earlier. Do check out the link as well for the recipe. For this Ganesha Chaturthi make this special modakam for neivadhayam and enjoy the day. May the blessings of Lord Ganesha always be upon all of us. I have already made kaara kozhukattai/Uppu urundai earlier with red chillies and posted before, but now I made the same kaara kozhukattai with green chillies and ginger. This kaara kozhukattai is a wonderful and a healthy evening snacks for kids after school. I made this kaara kozhukattai for Vinayagar chathurthi and I am sharing it with you all. The first thing that comes to mind when it is Ganesha/Vinayagar Chathurthi is Modhakam which we prepare as special offering for Lord Ganesha. 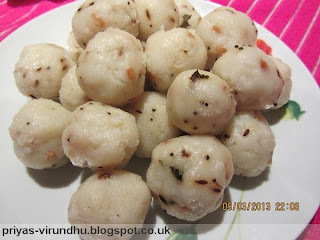 We also prepare different types of kozhukattai’s like paal kozhukattai, kaara kozhukattai, pidi kozhukattai etc. When we make modhakams or kozhukattai we always tend to have some dough left, this mani kozhukattai is usually prepared with that dough only. But nowadays we all prepare this mani kozhukattai separately as offering to Lord Ganesha. Not only for Ganesha Chathurthi, I make this mani kozhukattai as evening snacks for my kids and they love it because they are cute and tasty. Vinayagar Chathurthi/Ganesha Chathurthi is the birthday of Lord Ganesha celebrated all over India and many other parts of the world by Hindus. On this auspicious day, delectable neivadyams are made for Ganesha and special poojas are performed as a mark of celebration. 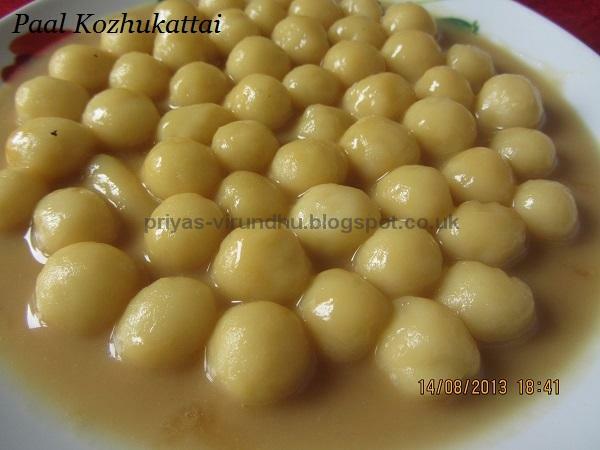 Kozhukattai is a very special dish prepared for Vinayagar Chathurthi. But there are different types of kozhukattai’s like the modhagams, Kaara Kozhukattai, sweet kozhukattai etc. Paal Kozhukattai is one among them, which is nothing but small rice dumplings cooked in coconut milk along with either jaggery or white sugar. I always prefer to make it with jaggery/vellam as it is healthier than the white sugar. Not everybody has time to soak, drain and grind the rice to make the traditional uppu urundai, if you are one among them here is the way to make it.